The OFFICIAL Drunk Yoga book by the rebel behind the viral phenomenon! In addition, you’ll learn the Drunk Yoga rules (so you don’t make any pour decisions), partner activities (so you won’t have to drink alone), hilarious fun facts, crazy stories from real Drunk Yoga classes, poems, drawings, and other fun surprises! Full of wine, yoga, jokes, and joy, Drunk Yoga is for the experienced yogi, the average barfly, the social butterfly, and the wallflower who needs a few sips of liquid courage. It’s about wine. And yoga. And not taking yourself too seriously. 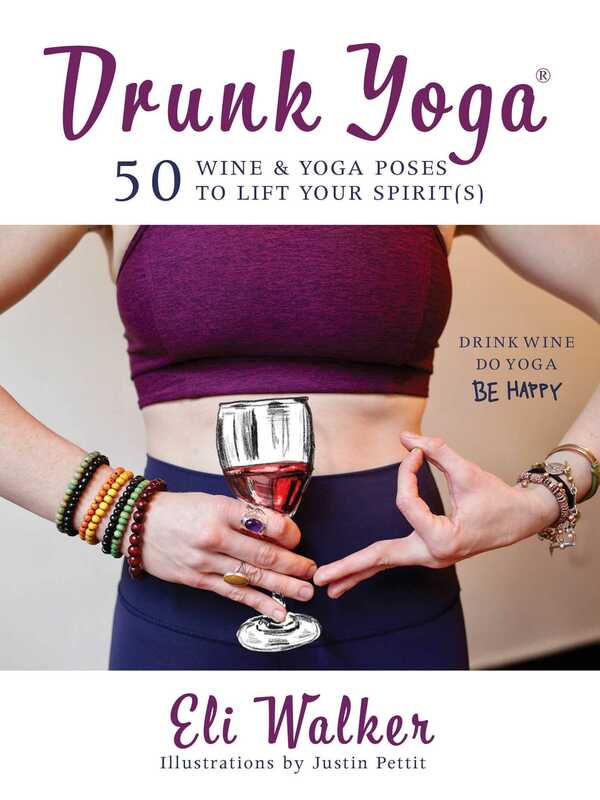 Already a huge hit for bachelor and bachelorette parties, birthday celebrations, and even office and team-building activities, this official book is founder Eli Walker’s newest way to bring Drunk Yoga to you, wherever you are. Drink wine. Do yoga. Be happy. Eli Walker was born and raised in rural Wisconsin before moving to Manhattan to attend New York University’s Tisch School of the Arts for Acting. As an actor, she trained at the Lee Strasberg Institute, Experimental Theatre Wing, and Stonestreet Studios, as well as the Upright Citizens’ Brigade and the Magnet. Under the direction of Tony award-winning director Elizabeth Swados during college (Political Snorts, 2009 and Revolting Rhymes, 2011), Eli discovered a knack for satirical writing and interactive performance art. Other writing credits include several one-woman shows she performed in New York, including “STEPS” at Wings Theater, “COUNTING” at ETW, and “The Quarter-Life Crisis Monologues” at the PIT. A professional yoga teacher for many years with training from Atmananda Yoga and Katonah Yoga in Manhattan and the Himalayan Iyengar Institute in India, Eli developed her niche by integrating the art of storytelling with yoga to help people live more empowered lives with a greater sense of conscious authorship. An experimental artist at heart, Eli thrives on bringing yoga to non-yogis in unconventional settings. She does so currently through her company Divine Your Story, and, most recently, Drunk Yoga… which is why you're here... reading this bio. Justin Pettit received his degree in graphic design from the Art Institute of Indianapolis and has been Art Director at Dow AgroSciences since 2013. He lives in Indianapolis, Indiana.